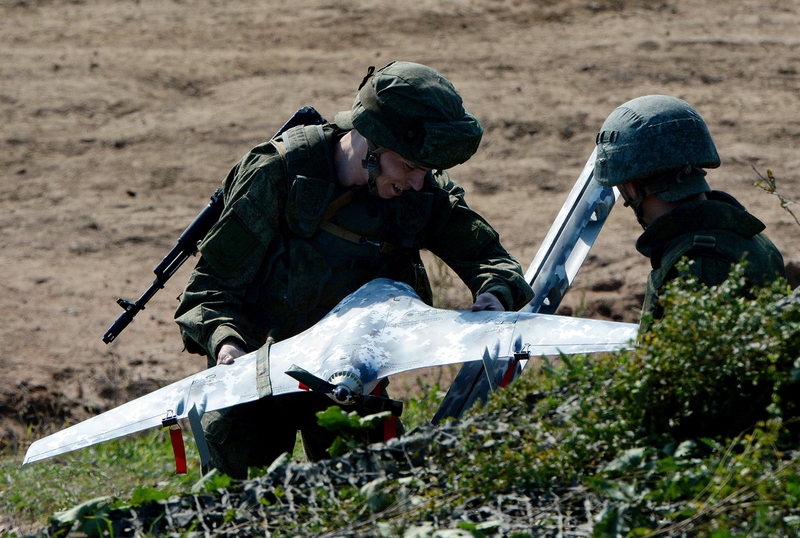 Russian servicemen prepare to launch a drone during the Indra 2016 joint Russian-Indian military exercise at Sergeyevsky base. A robotic mobile system provided to the Russian military will pinpoint enemy drones, and direct the air defence systems in their direction. The Russian army is set to receive a unique robotic system which will be able to detect light reconnaissance and attack drones without help from humans. The system stays invisible in the radio frequency region, not allowing its anti-radar missiles to be destroyed. The "Non-radiating radar system" (NRS), developed by JSC Zavod Elektromash, is a small remote-controlled all-terrain vehicle, with rubber tracks, the shell of which is equipped with a receiving antenna of the passive radar. Less than two metres long and 1.5 m wide, the weight tracked platform weighs around a ton. The NRS can reach speeds of up to 12 km/hour, while remaining virtually silent because of the use of the motor. The system can detect enemy drones at a distance of 5 km via the on-board radar and up to 3 km via optoelectronic means. “Work on developing the system is on and will continue until mid-2017,” said Anatoly Sokolov, general director of Elektromash, to Izvestia. “After the complex undergoes all the necessary internal tests, it will be delivered to the Ministry of Defence. The system continues to be improved, and we are also preparing a portable version of the device that can be landed, that will not weigh more than 30 kg, but will save all the performance characteristics of self-propelled device,” he said. The key element of the NRS system is the unique passive radar which, unlike conventional radar, does not emit any signals, and operates on the principle of a powerful antenna receiving signals from other transmitters. It is capable of pinpointing drones on any signals emitted by them. The on-board computer system analyses the data and determines the location of the source. Leonkov said a more effective device against these drones can be called passive type radars that detect the UAV, regardless of their size, intersecting the operator signals transmitted over the air. “Such radars, which operate on the principle of the receiver have a serious drawback: they need a large antenna field, which hinders the creation of rapidly deployable mobile passive type radar. As a result, most miniature western samples turn out having a minimum size of vehicle,” said Leonkov. He explained that if the Russian company has been able to create a miniature passive radar, which weighed less than a ton, it was a significant achievement. “This product is unique and can give a significant advantage to the Russian military on the battlefield,” said Leonkov.